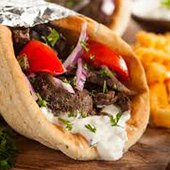 Chicken, or lamb and beef served with lettuce, tomato, onions, and your choice of tzatziki or harisa sauce. 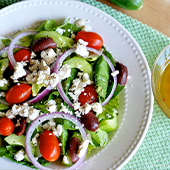 Romaine lettuce, tomato, feta cheese, cucumber, kalamata olives, and house salad dressing. Served with pita bread. 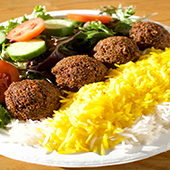 Basmati rice, served with 2 kabobs with choice of: gyro, chicken, steak, leg of lamb, or shrimp. 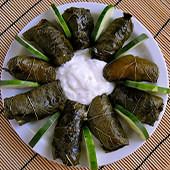 Cold grape leaves stuffed with rice. 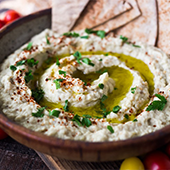 Choose two tasty appetizers (hummus, tabouleh, dolmas, baba ganouj, salata houriya, salata mishiya). Served with pita. 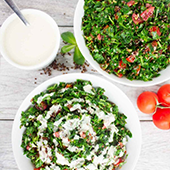 Choose three tasty appetizers (hummus, tabouleh, dolmas, baba ganouj, salata houriya, salata mishiya). Served with pita. Choice of any cup of soup and a Greek salad. All natural leg of lamb marinated with harisa sauce and special spices over a Greek salad. Greek salad with your choice of chicken or Gyro. 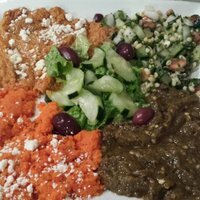 All natural domestic lamb, chopped and served with lettuce, tomato, onions, and your choice of tzatziki sauce or harisa sauce. Grilled steak and onions topped with swiss cheese and tzatziki sauce on a fluffy pita. Served with lettuce, tomato, and onion. Grilled and seasoned organic grass fed beef topped with feta cheese, tomato garlic sauce, lettuce, tomato, and onion on a fluffy pita. Ground garbanzo beans with a special blend of spices, served with lettuce, tomato, and onion in a fluffy pita, topped with tzatziki sauce. Steamed semolina with veggies and lamb with fine Tunisian flavors. Juicy chicken breast stuffed with spinach and feta cheese, topped with a garlic tomato sauce. 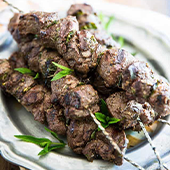 Fresh domestic lamb marinated with harisa sauce and special spices. Served with Greek roasted potatoes. 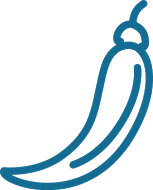 A Moroccan specialty! 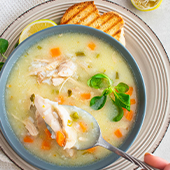 Slow cooked chicken with preserved lemons, olives, and a special blend of spices and sesame seeds. Served with your chioce of basmati rice or cous cous. A Moroccan specialty! Moroccan style lamb stew with a sweet and savory flavor, with prunes and sesame seeds. Served with your choice of rice or cous cous. 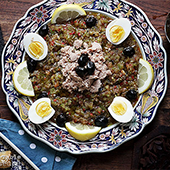 Tunisian style casserole. Layers of eggplant, zucchini, organic ground beef, potatoes and assorted cheeses. Roasted free-range chicken marinated with harisa sauce. Served with roasted potatoes. 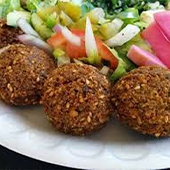 Five falafel balls on a bed of lettuce topped with tomato, onion, and tzatziki sauce. 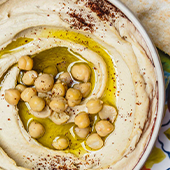 Served with 2 dolmas, hummus, tabouleh and a fluffy pita. Hummus, tabouleh, baba ganouj, and dolmas. Served with pita bread. 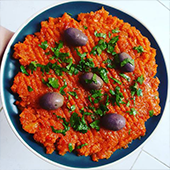 Steamed fine Tunisian semolina, topped with seasonal vegetables and saffron tomato sauce.